Here’s an easy new year’s resolution: Swap out your fast food lunch for something healthy and fresh, like an organic salad or sandwich from Mixt Greens. The company, founded in San Francisco in 2005, will be opening four new DC locations; the first will open on January 26th at 1200 19th Street, NW. Mixt Greens join hometown faves Sweetgreen in offering tossed-to-order salads and sandwiches made with local, seasonal, and organic ingredients. “Our salads taste different because of the ingredients we source and the way we prepare everything from scratch,” says Andrew Swallow, Mixt Greens’ Chief Culinary Officer. One seasonal salad that’s only available during the winter months is the aptly named “The Porky,” made with mixed greens, spice-rubbed pork tenderloin, roasted butternut squash, Applewood smoked bacon, sliced seasonal apple, and house-made Champagne vinaigrette topped with a port wine reduction drizzle and chopped pistachios. You’ll also eat in earth-friendly surroundings thanks to Charlottesville-based William McDonough + Partners, which designed the modern, urban restaurants incorporating eco-conscious materials. 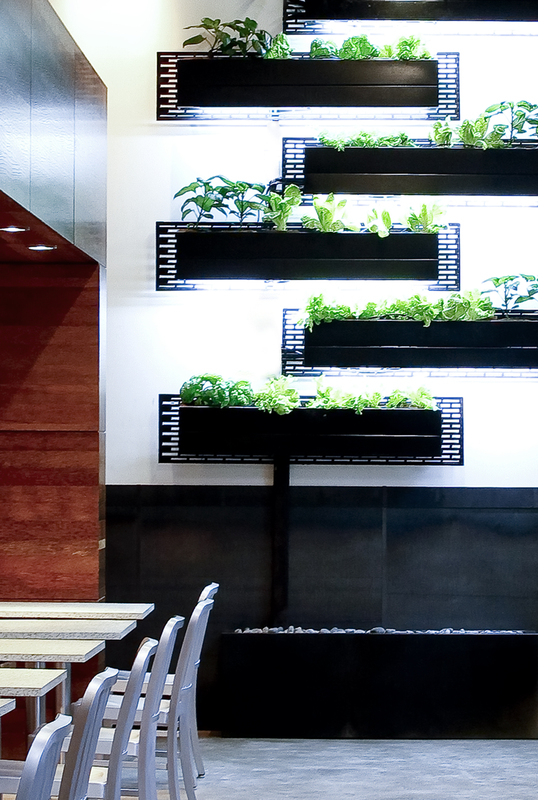 Each location also features an edible living wall of seasonally rotating herbs and vegetables. The wall highlights indoor urban agriculture, a low-energy, high-yield farming technique, showcasing that sustainable, fertilizer/pesticide-free, healthy food can be grown indoors in urban environments. What else besides the food and building design makes Mixt Greens green? All of packaging used by the restaurants is 100% compostable and biodegradable, they purchase renewable energy credits through Renewable Choice, and they use only non-toxic and biodegradable cleaners from Method. In addition to the restaurant at 1200 19th Street, three venues will open between February and April: 2010 at 1311 F Street, NW, 1700 K Street, NW and 927 15th Street, NW. Each location will be open Monday through Friday from 10:30 AM to 3 PM, and prices will range from $7.95 to $11.95 for salads and $8.95 for sandwiches, which are served with a side salad of greens.